Whenever a friendly Mech dies, gain +2/+2. One bot's junk is another bot's AWESOME UPGRADE! Found out about this guy's existence by discovering him with Dr. Boom. Then I played him with Micro-Bots next turn. Eat 7/11 Rush with Arcane Missiles taped on, punk. Might make a comeback if Wild Mech Warrior is a thing? Especially with Dr Boom's Rush effect. 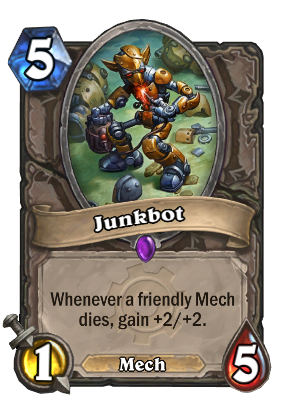 Its's really not as slow and bad as you guys think, if you play this guy when your about to trade some of your mechs into your enemies minions, just it only takes 2 of your mechs to die to get value. Its high starting health means it has a good chance to survive until you can buff it even more. turn two, mechwarper. turn 3, coin and this guy. turn four, anoyatron, mech golem, 2/1 gnome mech thingy. Or don't draw him until you are top decking, 5 mana 1/5. mechwarper makes every play seem good, but one can't expect to mulligan the most insane combination every single game. Junkbot---Junkcard. Only the Animation is worth mentioning. Man, the golden version stands out with that animation. Too bad the name so literally describes the card. Junkbot is garbage. If it had Charge, (even with the terrible 1/5 base stats), it would see play, and make for some very interesting games. Sure, it's bad on its own, but when you're running it in a full mech deck you can force your opponent into some tough choices, especially with its ability to soak 5 damage. If I've got out Arcane Nullifier X-21, Mechwarper and Iron Sensei let's say, what are you going to do? Do you waste yourAssassinate on this? Or let my buff train keep rolling? Also gives you freedom to toss more minions at the enemy as throw aways. Clockwork Gnome becomes a really great buy when its a 1 cost 2/1 that gives +2/+2 and a Spare Part. Card is just more valuable than the words on it is all Im saying. A vanilla 5 drop should have 2m+1 = 11 total stat points. This has 6, so you're losing 5 in exchange for that text. You get 4 more stat points per mech that died, so for this to even have value you need to sacrifice 2 mechs. That's really not worth it. If it was a 2/6 then you could trade 1 mech in exchange for 1 extra stat point over normal value - at least then this card would be decent. If he had one more attack, then he be fine. Even then, not many would make room for him. Only good if you can make two good trades with your friendly mechs on the turn you play this. 5 mana 5/9 in that specific case, which is great, but that (probably) takes too much setup. The name says it all. Maybe you want to make a garbage deck. This could be your dream come true. One mans trash is another mans treasure lmao. Would be good if there were mech-tokens; but as far as i saw it there aren't any. More like Scavenging Hyena v2.0; gain a buff to both stats whenever a certain type of minion dies. This has more health, and gains more health, so it has a better chance of staying on the board. But it also costs significantly more (probably fairly). It only really needs one minion to die to have okay stats for a 5 cost: a Feugen with -1 attack and the chance to grow much bigger, albeit with a vulnerability to silence as well. My exact words upon reading.